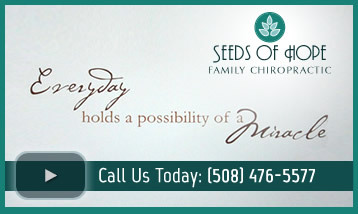 Dr. Michael Spratt established Seeds Of Hope Family Chiropractic with the goal of serving the entire Blackstone Valley through gentle and effective upper cervical chiropractic care. Our practice is conveniently located in Douglas, just minutes from RT 146 (exit 4). Dr. Spratt is the only chiropractor in Massachusetts, and one of only two in all of New England, who utilize the Blair technique. This method of upper cervical correction is so gentle and effective that patients drive from as far as Boston, Rhode Island, Connecticut, and New Hampshire to benefit from his specialized care. You can read on our Meet the Doctor page about how upper cervical care brought healing to Dr. Spratt himself. Where do you want to go? What are your health goals? What’s going on with your body, and why? When and how can I reach my health goals? Are you looking for healthcare with a holistic and natural approach? We deliver specialized, quality chiropractic care to help you reach your health goals and enjoy a greater quality of life. Patients of all ages respond well to this approach. And Seeds of Hope has a nice mix of patients, children from elementary ages to teens, infants, families, and many elderly patients who Dr. Spratt has a special passion to care for. Experience the benefits of chiropractic. Call us at (508) 476-5577 to learn more today.